The best cheap business class flights to Phoenix from London we found for a client in the past month were for an amazing £1,775. To get today’s best price simply complete the form on this page and we’ll get back to you quicker than you can say “Camelback Mountain”. Situated in the middle of a desert which receives barely more than 200 millimetres of rain per year, it seems rather odd for a major city such as Phoenix to even exist in such a place. More than a century ago, you would have been right, but thanks to the many miracles of modern technology and a deep aquifer which has supplied the region with drinking water for generations, more than 4.5 million Americans have made the sunniest major city on Earth their home. Need a break from the dreariness of a British winter? 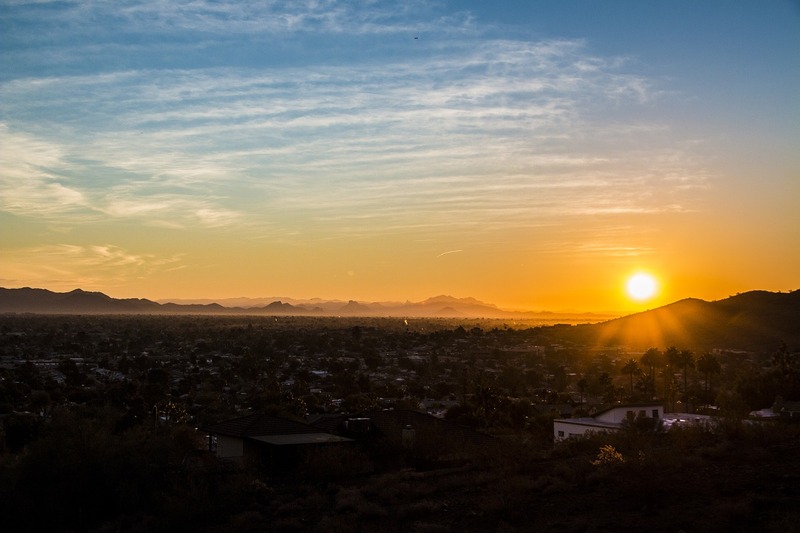 With an average high of 20 degrees Celsius in January, Phoenix has all the vitamin D you’ll need, along with plenty of attractions to keep you busy during your stay here. At present, only one airline offers non-stop business class service from London to Phoenix – British Airways. Passengers flying with British Airways on the London to Phoenix route will get there aboard a Boeing 747-400. 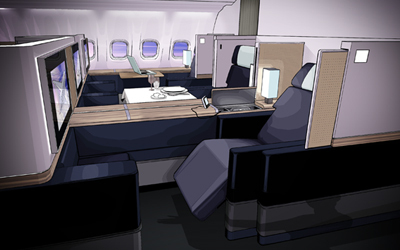 This plane features two levels of business class seating, with the upper level being far more intimate with its 2-2 seating configuration and its complete removal from economy class. Business class on this plane is fitted with reverse herringbone seats, which can make for a potentially awkward experience during take-off and landing. During these times, the privacy screen is retracted, effectively forcing to gaze into the eyes of the person directly across from you. If the thought of having to endure this situation bothers you, have a friend or family member book the seat across from you, if possible. In addition to the entrees served during meal times (which may also include tea – complete with proper finger foods), British Airways sets aside a spot for business class passengers who get hungry between appointed meal times. Known as the Club World Kitchen, it is a mini-bar which offers fresh fruit, chocolates, crisps, soft drinks, alcohol, and other snacks and refreshments for those with hollow legs that need filling. What facilities are available at Phoenix Sky Harbor International Airport? There are numerous lounges at Phoenix Sky Harbor, but if you arrive here on British Airways, it makes sense to use the one set aside for the airline, as entrance is exclusive to its business class passengers. It may be smaller than facilities at other airports, but it makes up for its humble footprint with quality food, friendly staff, and an incredible view of the tarmac outside. As for the terminal, it comes with an outdoor walking track designed to help you stretch your legs after a long flight. With fine views of the Phoenix skyline, the mountains that surround the airport, and one of the tallest air control towers in the USA, it is definitely worth a look before heading downtown. If you are looking to hire a taxi to take you into Phoenix City Centre, expect to pay around $23, inclusive of the recommended 15% tip for this profession in America. Staying out in Scottsdale? This popular shopping and nightlife hub in the suburbs is a bit further from Sky Harbor, so you will need to pay your driver around $30, gratuity included. Within Phoenix, Valley Metro Rail makes getting around town relatively easy, with a single line stretching 42 kilometres from end-to-end, with a stop at Sky Harbor Airport midway. However, the sprawly nature of the Phoenix area makes the use of cabs or rideshare services inevitable, so keep the number or app of your preferred option handy when it comes time to do some exploring. Looking for a reasonably priced place in Phoenix which delivers a ton of value for money? Homewood Suites in North Phoenix offers unique amenities like an outdoor basketball court, an outdoor BBQ grill, and a complimentary breakfast which features eggs and plenty of meat options. It also has easy access to a major shopping mall, making it easy to stock up on provisions before sightseeing. business class flights to Phoenix would be wasted without a stay in one of the following luxury hotels. SkyClub recommends, the Kimpton Hotel Palomar Phoenix and it stands the best chance of living up to your lofty expectations. From a daily wine hour where complimentary glasses of vino are served to guests to a rooftop pool which boasts a killer view of the city, you’ll enjoy your downtime back at the hotel just as much as the excursions you will enjoy during the day. Naturalists will love what they find at the Desert Botanical Garden. Specialising in flora endemic to the Sonoran Desert, visitors will find more than 2,100 species here, 139 of which are threatened or endangered. Keep your eyes open for agave, the plant from which tequila is distilled, and the Cristate Saguaro cactus, which divides into many branches at their tops. Culture hounds will not want to miss the Heard Museum, as this institution tells the story of the Navajo people and other native groups who called the Sonoran Desert home. Long before a single skyscraper or golf course was constructed in the area, these resourceful tribes used their knowledge of local geography, plants, and animals to live off this land for countless generations. The exhibits of the Heard contain artifacts that include jewelry and Hopi kachina dolls, along with more sobering displays, which relay stories of abuse which was leveled against Natives by the authorities in the past. We will find you special, discounted fares that are not available online. So, by the time you take your business class flights to Phoenix, you’ll feel happy knowing that you’ve paid less than the person seated nearest to you! Have a great trip and – if you want to save money – please book with SkyClub.